It is a common solution to may iOS related problems, so we are certain that you have come across, “Reset Network Settings” at some point while using your device. Although it may be a handy solution for most iOS problems even iOS 12 problems, it is important to understand just what resetting your device does. This way, you will be better informed when making the decision to reset the iPhone. This article explores what “Reset Network Settings” on your iPhone (including iOS 12) really is and what it is used for. Part 1. What Is “Reset Network Settings” on iPhone? Part 1 What Is “Reset Network Settings” on iPhone? Reset Network Settings is simply a way to get everything about network back to the original (factory) settings. It is essentially a way to start from scratch which is why it is a good way to solve many network related issues with your device. When you perform a Network Reset, all network settings revert back to what they were when you bought the device (in other words the factory setting). This includes all the cellular settings, Wi-Fi passwords and even Bluetooth settings. This means that all your Wi-Fi passwords, Virtual Private Networks that you’ve set up will be erased and you’ll have to rejoin the networks. Your Bluetooth connections will also be removed and you will have to set those up again. If your network is not performing as expected, a network resetting is a good way to fix the problem. Here’s how to do it on an iPhone or iPad. Step 1: Tap on the Settings app on your device to open it. Step 3: select “Reset Network Settings” and then confirm that this is what you want to do. Now that you know what “Reset Network Settings” is and are aware of how to do it, you may be wondering why you would need it. The following are just some of the problems it can fix. Sometimes the network on your device can just quit. But before you consider bring your iPhone to a repair shop, try resetting the network settings. Once you rejoin the networks, your device should work just fine. If your Wi-Fi connection is not as good as it should be or is facing some problems connecting after updating to iOS 12, resetting network settings may be a good solution. 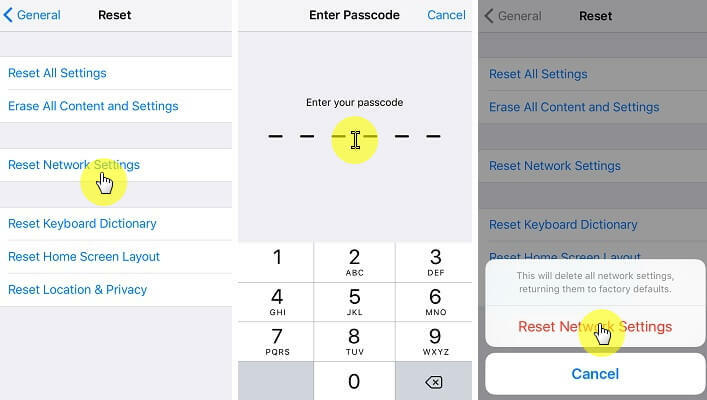 If you are having problem connecting to a Wi-Fi network in daily use or after updating to iOS 12 and you are sure you’re entering the right password, resetting the network settings can be of great help. When your device shows “No Service” you can try to toggle “Airplane Mode” on and off. But if the problem persists, the best solution is usually resetting network settings. When you can’t send, or receive iMessages and are unable to even turn the option off, you may want to reset network settings. This action works with just about any iMessage issue you may be having. You may see a message saying the device couldn’t be synced due to a connection error. Resetting network settings works to fix this issues. Although you may also want to reboot the computer before trying to sync again.